Joel Green's Thesis: "If, as is often alleged, neuroscientists have discredited a dualist interpretation of the human person, I want to explore the usual corollary that, in doing so, they have also discredited the biblical faith. It will become clear that I take the former claim to be true, the latter to be false." Green claims that scientific discovery supports non-reductive physicalism and that the Bible does not deny it. According to Green, we are distinctively human to the degree to which we obtain six powers or capacities. These capacities are present in other animals to some degree but highly developed in the human species. The six capacities are language, a theory of mind, episodic memory, conscious top-down agency, future orientation, And emotional modulation. Green’s view is a form of functional holism, the view that a person’s faculties work together in a single system. This doesn’t tell you anything about what is functioning. Is it a soul, a brain, or what? Compare it with its ontological cousin, ontological holism, the view that a person is composed of a single substance. Notice that functional holism does not imply its cousin. One cannot move in that direction. If, however, one holds to ontological holism, then perhaps functional holism follows. Green accuses theologians of importing Hellenistic and Cartesian presuppositions into biblical interpretation. It has long been argued that there is a difference between the Hebrew conception of reality and the Greek conception of reality while Hellenistic thought is defined by reference to a dual natured reality, Hebrew thought urges a holistic view whereby entities are not considered in terms of their parts. Consequently, though there are multiple terms for aspects of human life within the Hebrew scriptures none should be taken to refer to a distinctive, substantive, and ultimately separable, entity from the body. Since the Greek New Testament is derived from the presuppositions of the Hebrew Old Testament we should no more read Hellenistic presuppositions into the New Testament than we should read them into the Old. the distinguishing mark of human existence when compared with other creatures is thus the whole of human existence… As the Genesis story unfolds, the vocation given humanity entails individuality within community and the human capacity for self transcendence and morality - that is, the capacity to make decisions on the basis of self deliberation, planning and action on the basis of that decision and responsibility for those decisions and actions. Thus, there is a dual capacity for relatedness to God and proper functioning within the human family and in the world God created. The moral instincts of human beings uniquely arise from the use of their relational capacities. The social ethic is consequent upon right relationship to God who informs the relational conscience of the human being. if the neurobiological systems that shape how we think, feel, believe, and behave are for ever being sculpted in the context of our social experiences, then in a profound sense we must speak of personal transformation in relational terms. Our autobiographical selves are formed within a nest of relationships, a community. The exclusion context of conversion could scarcely be more sharply emphasized. Green argues that the neurobiological base is sufficient for the organization of information. There is, therefore, no possibility of rationality apart from the brain. This most adequately explains the causal relationship we can demonstrate between brain damage and the consequent impeding of rationality. How then does this square with the biblical account of conversion? Green argues that the biblical authors consider conversion in terms of a “transformation of day-to-day patterns of thinking, feeling, believing, and behaving.” Repentance should be analyzed in terms of a transformation of the capacities of human beings to operate according to their design. Conversion is manifested in the community of God’s people. Thus, conversion is a process of socialization formed by the reorientation of life. The practices of the church are means by which conversion is experienced as the faculties of the human being are trained to function properly, actualizing the powers fully and in the correct direction. The emphasis on socialization leads Green to conclude that salvation, broadly understood, should refer to the transformation of global society through renewed practices, the embodiment of a converted, renewed community. Green notes that on most views of physicalism one is hard pressed to support a libertarian view of free will. To what degree is a human agent morally responsible if he is causally determined? Green argues that if one is morally responsible then one has acted out of a desire. The act itself is freely done if and only if it is done according to the volition of the agent and are not coerced. Green’s form of compatibilism denies that a person is morally responsible if and only if they could have chosen to do otherwise. In contrast, life is defined in terms of relationship especially relationship with God. Green points to several texts that speak of life and death in terms of relationality and concludes that this is the primary sense of those terms in scripture. If death is the cessation of the capacities for personal relationship, resurrection is the restoration and renewal of those capacities. Rather than the continuance of a substantive soul in the afterlife Green argues for a view which allows for no conscious experience to occur between the bodily death of a human being and the resurrection when a glorified body is provided. At this point Green critiques Cooper’s argument for the substantive soul in the intermediate state. In contrast to Cooper, Green argues that the Old Testament never suggests that an essential part of a human being survive death. There is no personal existence beyond death until the resurrection. What, then, should we say about the New Testament? It seems that the New Testament presents some specific examples of the endurance of personal identity between the time of bodily death and resurrection. For example, the story of the rich man and Lazarus portrays a dead rich man fully conscious and speaking prior to his resurrection. Green argues that in order to interpret this as assuming the endurance of a conscious substance between death and resurrection one has to view the parable having taken place at the time of telling. But this is not necessitated by the parable. One has to assume that the time in question is during the intermediate state but this is not demanded by the text. Rather, Green thinks it more plausible that the time in question is after the resurrection. Lazarus already finds his place in Abraham’s bosom. Surely this picture conjures up a future, fully restored, and embodied state not a state of waiting. Green also suggests that the suffering of the rich man indicates that he has reached Hell, a place of continual torment. If so, then the parable does not clearly indicate a conscious disembodied state. Perhaps it might be argued the Bible does not indicate a conscious intermediate state. Let’s concede this point. However, it is still far from clear how an identity can endure even if we assume that the Scriptures do not indicate a conscious enduring of identity. What exactly is it that does endure between death and resurrection? One might accept that a body is identical to a person and that same body is resurrected at the future time but if there is a gap in which there is no conscious subject what exactly endures through time? Green recognizes the problem and seeks not to suggest that the necessary and sufficient condition for the endurance of a personal identity is found within the body. This might be a tempting strategy but as any good physicalist will tell you is an extremely difficult thing to do even when the identity and question is of a living conscious person. Even more difficult then to provide the necessary and sufficient conditions for the persistence of persons when they are dead. Wisely, Green suggests another strategy, that is that identity is not grounded in the faculties of the human being alone but also in the mind of God. In order to contemplate a possible way in which personal identity persists after death and prior to the resurrection Green argues for a somewhat Lockean view of personal identity. John Locke thought that human identity is a feature of a set of experiences stored in the memory. To endure through time, according to Locke, is to sustain that set of memories. If those memories continue in a subject as memories experienced by that subject, then that person persists through time. “our identity is formed and found in self-conscious relationality with its neural correlates and embodied narrativity or formative histories.” Since the memories can be restored to resurrected bodies a person can cease to exist entirely if as memories are stored somewhere and then returned to be resurrected body. Though Green is not clear on this point it seems that he conceives of identity in terms of the storage of those memories of that personal narrative within the mind of God in the intermediate state. Though strictly there is no person who endures through time there is nonetheless the content of that person’s memory, even perhaps an idealized comprehensive memory that, when the time comes, can be put back into the resurrected body such that, at least as far as the resurrected person experiences it, is continuous with the life is lived before death. Has neuroscience proven that there is no soul? Do you think it is likely that any science could prove that there is no soul? How might there be empirical evidence for the non-existence of the soul? The standard Gage argument is something like this: If personality is a property of the soul then it should not be affected by changes to the brain. But plainly personality is affected by changes to the brain (Gage’s personality was affected by injury). Therefore, personality is not a property of the soul. Whadaya think? Here is one argument, the argument from localization: With the increased ability to watch the brain in real-time comes an increased knowledge of how tasks relate to particular parts of the brain. Research that shows that there are local parts of the brain that are responsible for memories, language, and other mental events. Since it has long been assumed that memories and perception were related to a nonphysical entity, the fact that the brain appears to have parts with designated tasks lends credence to the point of view that the brain achieves tasks commonly thought to be solely those of the soul. How strong/weak is the argument from localism? Recently, scientists have invented a micro chip that, when implanted in the brain, can restore the function of a previously nonfunctioning limb. Does this show that dualism is false? Also recently a group of scientists have discovered that one can increase a person’s capacities for learning information through stimulating the scalp with electrical currant. Would information transfer itself prove dualism false (think Matrix and “downloading” information into Neo). In the movie Collision a one man has another man’s memories implanted in his mind. He sees the world as if he is the other person. If this was possible would it prove dualism false? Why or why not? If neuroscience has not proven that there is no substantive soul, what has it shown? Plausibly, the best neuroscience could show is that the phenomena usually associated with a substantive soul can be adequately explained without reference to a substantive soul and only with reference to a body. Does this argument work? Why or why not? Green presupposes a view of the relationship between science and religion. He says, “the neurosciences and biblical studies come at these issues from quite different perspectives but end up making a series of complementary affirmations.” How does Green suppose that science and faith are integrated? Do you think he takes the right view? How else might one relate the two? Has Green successfully dealt with the text? Is his exegesis sound? Which way does the evidence point? Does the text remain neutral on the existence of a substantive entity? Can it “take” both positions equally well? Does the grammar tell us anything about whether it is being used as a noun (the soul) or as a set of capacities? Green interprets the image of God functionally. Do you agree? What reasons are there to reject this view? If capacities/powers are fundamental to human persons, are they fundamental to persons per se? What follows from this? Are there any ethical objections? (An ethical objection might be: An embryo has no functions. Therefore, an embryo is not a person). Green supposes that a person can cease to exist and then be brought back to life. Is this intelligible? What might be a good reason to reject this view? If person, A, ceases to exist at t1, in virtue of what exactly, is it that the person who is recreated at t2 is the same person who existed at t1? Consider A living for a minute or two and then being annihilated and then, after a minute or two, being brought back to life. Suppose this system of living meant that A exists only half of the time. A would be immortal if this kept on going since A’s moments would never be a last moment. Yet A would only exist for half the time. A would have a half-life, so to speak. Odd or just a consequence of the view? Does memory do the identity trick? Consider: Person A is the same person prior to t1 when she ceases to exist as t2 when she is recreated if and only if the memories of A are the same memories at t1 as they are at t2. But this is just another way of saying that A is the same person. Memories are had by a person. If you say person A is identical to her memories, then you are not a physicalist. If you say the memories are not identical to the person, then you still have to say what makes A the same person at t1 and t2. 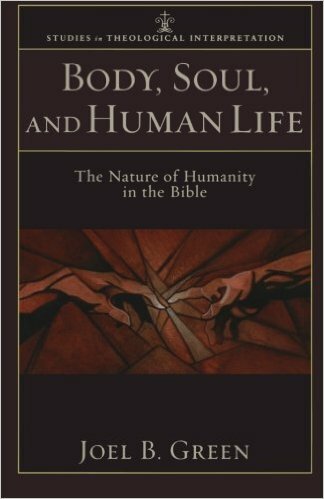 Joel Green, Body, Soul, and Human Life: The Nature of Humanity in the Bible (Grand Rapids, Baker Academic, 2008), 32. Colin Gunton, quoted in Green, 69.